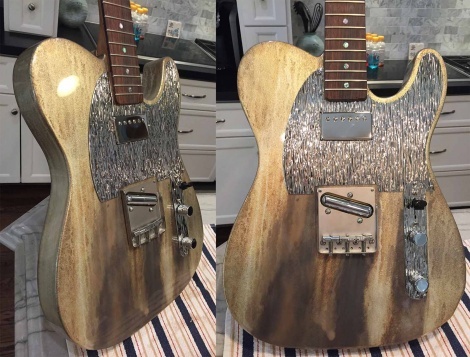 Thanks Brad for the slick photos, and a very unique Tele here. Created with a finish which could be like weathered sandstone. Fitted with a silver Lipstick bridge pickup, and humbucker in neck, with the SH Tele Silver River guard and Control plate set. Sure to be the blond head turner wherever she's seen. The Silver River range of guards is now available for many Strats & Teles, SoCal, and G&L.